If you want to relish pistachio ice-cream, almond biscuits and Martorana fruit, pasta with sardines or the famous arancini (stuffed rice balls)…this is the tour for you. Enjoy an authentic food experience in Agrigento in the best places in the city. The local gastronomic delicacies will make your stay even more enjoyable. 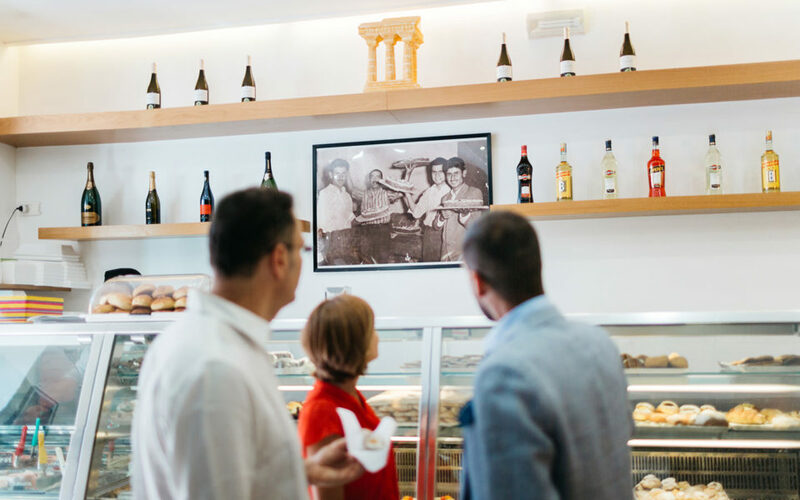 The Sicilian cannoli are not to be missed, and Lorenzo will be pleased to accompany you to the pastry shop where his family buys freshly made cannoli for Sunday lunch or during the main feasts so as to let you taste the most exquisite cannoli in the city. The food tour could not be complete without enjoying a glass of local wine and Sicilian finger food. Treat yourselves to the best Prosecco and Sicilian wines: Nero D’avola, Cerasuolo di Vittoria, Grillo… Lorenzo will customize the experience according to your tastes. Visits to oil mills, wine cellars, cheese factories and fish markets can also be arranged. – Best time to have the tour: from 09.00am to 08.00pm.